Buying car insurance can be about as harrowing as buying the car itself. There are so many auto insurance companies to choose from, and each one of them has different rates, discounts, and policies that can be quite confusing. 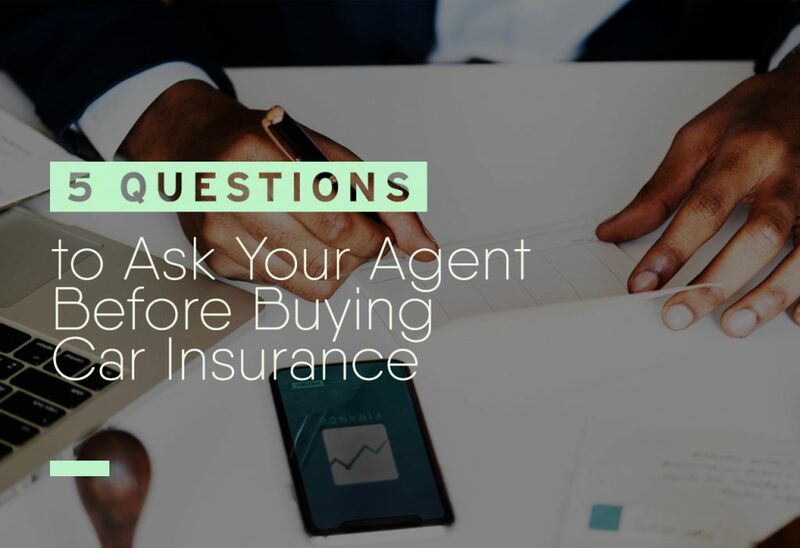 To compound the issue, when you talk to an agent, they may not offer you everything you qualify for without you asking questions to get the details first. Listed below are five questions to ask the agent before you decide on buying a car insurance policy. 1. What kind of coverage do I need? You need to know what your state requires according to what kind of car you have and how you are paying for it. If you have a lien on your vehicle, the company you are getting the loan through may require certain types of coverage as well. The primary types of coverage include collision, comprehensive, personal injury protection, and uninsured and underinsured motorist protection. Even if the answer seems obvious, you should ask this question. If you have a 15-year-old teenager who is learning how to drive, are they covered? If somebody borrows your car and gets into an accident, are they included, and will the insurance pay for the repairs? Are you covered if you borrow a friend’s car? Or, how about if you are renting a car and something happens? 3. What is the deductible? 4. What discounts do they offer? Each car insurance company offers an extensive array of discounts, but they are not going to tell you all of them unless you ask. Many offer discounts for being married, no past lapses in car insurance, clean driving records, and combining the car and home insurance. Some car insurance companies also offer discounts for parking in a garage rather than in your driveway or on the street, graduating from certain colleges, or even belonging to certain professional organizations. Some car insurance companies will only accept certain types of payments whether as a check, money order, credit card or debit card. Then there are also the timing of the payments. Many companies will offer discounts if you pay several months at a time. Month to month payments usually come with a payment fee each time you pay. Other common payments plans include quarterly, bi-yearly, and yearly. Sometimes there is also the option to pay the entire premium up front.